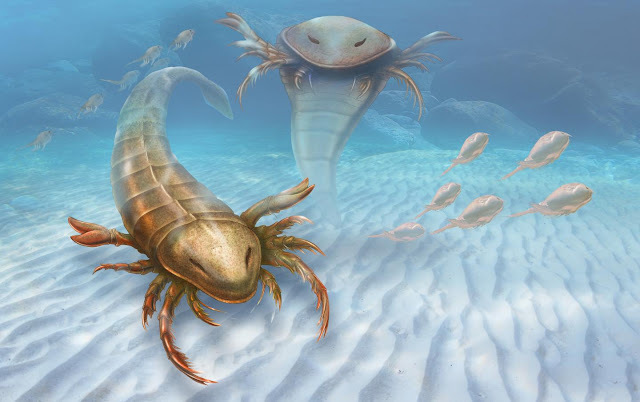 The fossil of a previously unknown species of 'sea scorpion', measuring over 1.5 meters long, has been discovered in Iowa, USA, and described in the open-access journal BMC Evolutionary Biology. This is an artist's impression Pentecopterus. Dating back 460 million years, it is the oldest known species of eurypterid (sea scorpion) - extinct monster-like predators that swam the seas in ancient times and are related to modern arachnids. The authors named the new species Pentecopterus decorahensis after the 'penteconter' - an ancient Greek warship that the species resembles in outline and parallels in its predatory behavior. 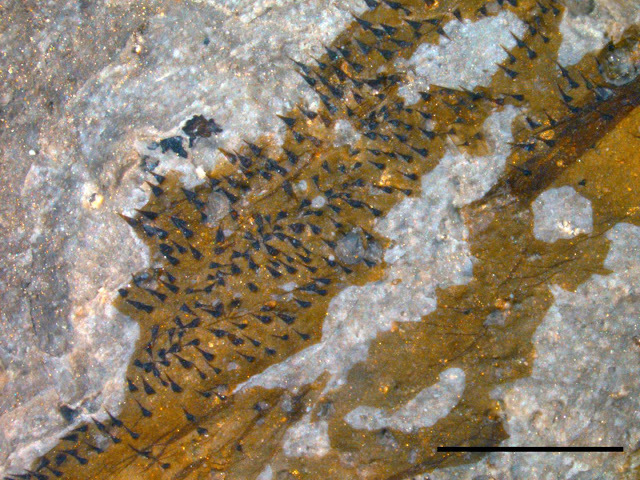 These are Pentecopterus hairs. Scale bar 1 mm. Lead author, James Lamsdell from Yale University, USA, said: "The new species is incredibly bizarre. The shape of the paddle - the leg which it would use to swim - is unique, as is the shape of the head. It's also big - over a meter and a half long!" He adds: "Perhaps most surprising is the fantastic way it is preserved - the exoskeleton is compressed on the rock but can be peeled off and studied under a microscope. This shows an amazing amount of detail, such as the patterns of small hairs on the legs. At times it seems like you are studying the shed skin of a modern animal - an incredibly exciting opportunity for any paleontologist." Some large body segments suggest a total length of up to 1.7 meters, making Pentecopterusthe largest known eurypterid from its era. This is a Pentecopterus leg. Scale bar 1 cm. Research into 430,000-year-old fossils collected in northern Spain found that the evolution of the human body's size and shape has gone through four main stages, according to a paper published this week. A large international research team including Binghamton University anthropologist Rolf Quam studied the body size and shape in the human fossil collection from the site of the Sima de los Huesos in the Sierra de Atapuerca in northern Spain. Dated to around 430,000 years ago, this site preserves the largest collection of human fossils found to date anywhere in the world. The researchers found that the Atapuerca individuals were relatively tall, with wide, muscular bodies and less brain mass relative to body mass compared to Neanderthals. The Atapuerca humans shared many anatomical features with the later Neanderthals not present in modern humans, and analysis of their postcranial skeletons (the bones of the body other than the skull) indicated that they are closely related evolutionarily to Neanderthals. "This is really interesting since it suggests that the evolutionary process in our genus is largely characterized by stasis (i.e. 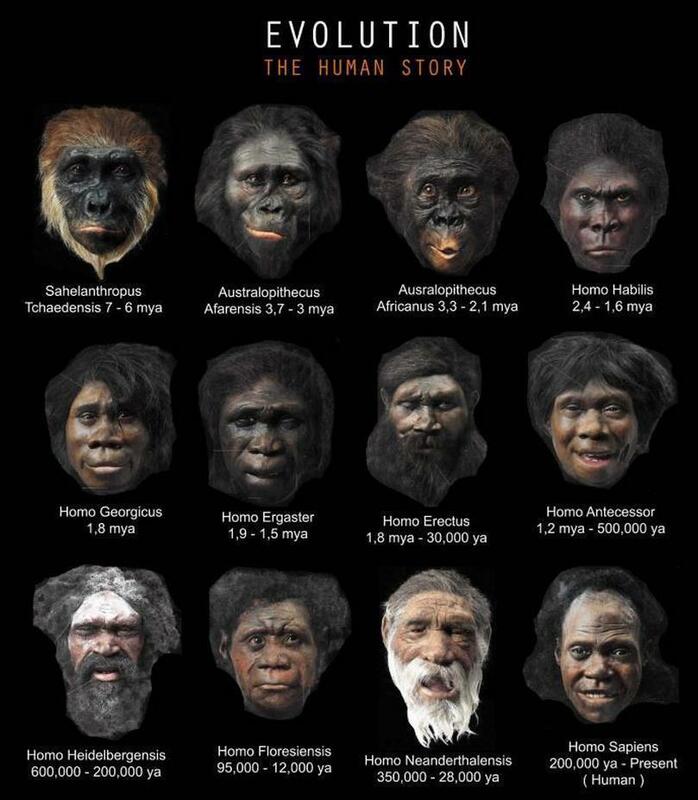 little to no evolutionary change) in body form for most of our evolutionary history," wrote Quam. Comparison of the Atapuerca fossils with the rest of the human fossil record suggests that the evolution of the human body has gone through four main stages, depending on the degree of arboreality (living in the trees) and bipedalism (walking on two legs). The Atapuerca fossils represent the third stage, with tall, wide and robust bodies and an exclusively terrestrial bipedalism, with no evidence of arboreal behaviors. This same body form was likely shared with earlier members of our genus, such as Homo erectus, as well as some later members, including the Neanderthals. Thus, this body form seems to have been present in the genus Homo for over a million years. It was not until the appearance of our own species, Homo sapiens, when a new taller, lighter and narrower body form emerged. Thus, the authors suggest that the Atapuerca humans offer the best look at the general human body shape and size during the last million years before the advent of modern humans. The study, titled "Postcranial morphology of the middle Pleistocene humans from Sima de los Huesos, Spain," was published in Proceedings of the National Academy of Sciences. Researchers from CSIRO and Imperial College London have assessed how widespread the threat of plastic is for the world's seabirds, including albatrosses, shearwaters and penguins, and found the majority of seabird species have plastic in their gut. A red-footed booby on Christmas Island, in the Indian Ocean. Based on analysis of published studies since the early 1960s, the researchers found that plastic is increasingly common in seabird's stomachs. The researchers predict that plastic ingestion will affect 99 per cent of the world's seabird species by 2050, based on current trends. "For the first time, we have a global prediction of how wide-reaching plastic impacts may be on marine species - and the results are striking," senior research scientist at CSIRO Oceans and Atmosphere Dr Wilcox said. Plastic fragments washing in the surf on Christmas Island, in the northeastern Indian Ocean. 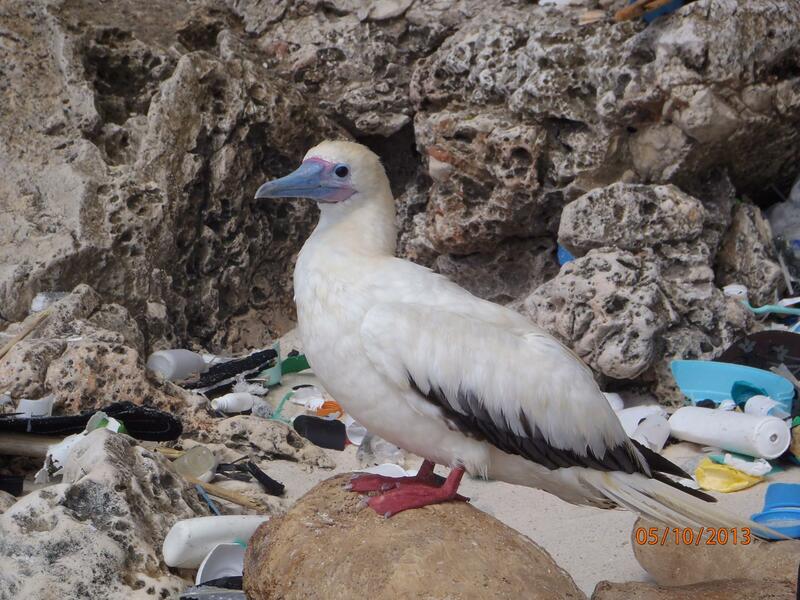 "We predict, using historical observations, that 90 per cent of individual seabirds have eaten plastic. This is a huge amount and really points to the ubiquity of plastic pollution." "Finding such widespread estimates of plastic in seabirds is borne out by some of the fieldwork we've carried out where I've found nearly 200 pieces of plastic in a single seabird," Dr Hardesty said. "We are very concerned about species such as penguins and giant albatrosses, which live in these areas," Erik van Sebille said. "While the infamous garbage patches in the middle of the oceans have strikingly high densities of plastic, very few animals live here." "Improving waste management can reduce the threat plastic is posing to marine wildlife," she said. "Even simple measures can make a difference. Efforts to reduce plastics losses into the environment in Europe resulted in measureable changes in plastic in seabird stomachs with less than a decade, which suggests that improvements in basic waste management can reduce plastic in the environment in a really short time." "Hundreds of thousands of volunteers around the world come face-to-face with this problem during annual Coastal Cleanup events," Dr Leonard said. "Scientists, the private sector and global citizens working together against the growing onslaught of plastic pollution can reduce plastic inputs to help protect marine biodiversity." Mummified Life Found Deep Beneath the Ocean Floor, Like Life Found at "Lost City"
Ancient rocks harbored microbial life deep below the seafloor, reports a team of scientists from the Woods Hole Oceanographic Institution (WHOI), Virginia Tech, and the University of Bremen. 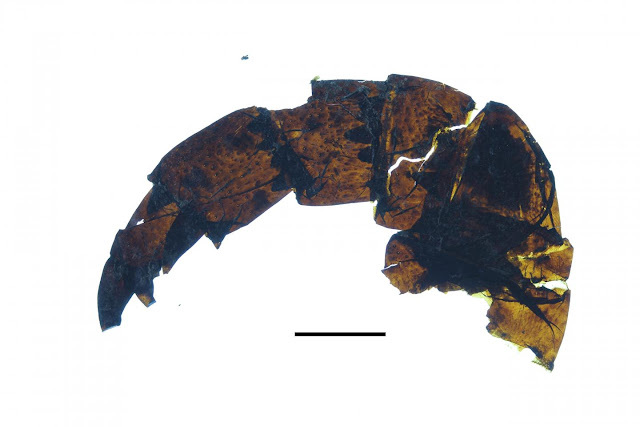 This new evidence was contained in drilled rock samples of Earth's mantle - thrust by tectonic forces to the seafloor during the Early Cretaceous period. The new study was published today in the Proceedings of the National Academy of Sciences. Scientist found mummified microbial life in rocks from a seafloor hydrothermal system that was active more than 100 million years ago during the Early Cretaceous when the supercontinent Pangaea was breaking apart and the Atlantic ocean was just about to open. Buried under almost 700 meters of sediment, the samples were recovered by the seafloor drilling vessel JOIDES Resolution near the coast of Portugal. Hydrothermal fluids rich in hydrogen and methane mixed with seawater about 65 meters below the seafloor. This process supported bacteria and archaea in what scientists call 'the deep biosphere' in rocks from Earth's mantle. Conditions for microbial life were nearly ideal, the study showed, in this seemingly inhospitable environment. The discovery confirms a long-standing hypothesis that interactions between mantle rocks and seawater can create potential for life even in hard rocks deep below the ocean floor. The fossilized microbes are likely the same as those found at the active Lost City hydrothermal field, providing potentially important clues about the conditions that support 'intraterrestrial' life in rocks below the seafloor. "We were initially looking at how seawater interacts with mantle rocks, and how that process generates hydrogen," said Frieder Klein, an associate scientist at WHOI and lead author of the study. "But during our analysis of the rock samples, we discovered organic-rich inclusions that contained lipids, proteins and amino acids - the building blocks of life - mummified in the surrounding minerals." These remarkable rocks, recovered by the Ocean Drilling Program (ODP) on board the drilling vessel JOIDES Resolution, are from the Earth's upper mantle that underwent intense alteration by heated seawater. The rocks show a systematic change in color from rusty brown (top) to green and black (bottom), reflecting the chemical gradients across the fluid mixing zone. These chemical gradients played a key role in supporting microbes with chemical energy and the substrates they needed to thrive. Fossilized microbes were found in white veins consisting of the minerals calcite and brucite. This study, which was a collaborative effort between Klein, WHOI scientists Susan Humphris, Weifu Guo and William Orsi, Esther Schwarzenbach from Virginia Tech and Florence Schubotz from the University of Bremen, focused on mantle rocks that were originally exposed to seawater approximately 125 million years ago when a large rift split the massive supercontinent known as Pangaea. The rift, which eventually evolved into the Atlantic Ocean, pulled mantle rocks from Earth's interior to the seafloor, where they underwent chemical reactions with seawater, transforming the seawater into a hydrothermal fluid. "The hydrothermal fluid likely had a high pH and was depleted in carbon and electron acceptors," Klein said. "These extreme chemical conditions can be challenging for microbes. However, the hydrothermal fluid contained hydrogen and methane and seawater contains dissolved carbon and electron acceptors. So when you mix the two in just the right proportions, you can have the ingredients to support life." According to Dr. Everett Shock, a professor at Arizona State University's School of Earth and Science Exploration, the study underscores the influence major geologic processes can have on the prospect for life. "This research makes the connection all the way from convection of the mantle to the break-up of the continents to ultimately providing geochemical options for microbiology," Shock said. "It's just such a nice demonstration of real-world geobiology with a lot of 'geo' in it." The rock samples analyzed in the study were originally drilled from the Iberian continental margin off the coast of Spain and Portugal in 1993. During the expedition aboard the research vessel JOIDES Resolution operated by the Ocean Drilling Program (ODP) - researchers drilled through 690 meters of mud and sediment deposited onto to the ocean floor to reach the ancient seafloor created during the break-up of the supercontinent Pangaea and the opening of the Atlantic Ocean. The drill samples had been stored in core repositories at room temperature for more than two decades, before Klein and his colleagues began their investigation and discovered the fossilized microbial remains. "Colonies of bacteria and archaea were feeding off the seawater-hydrothermal fluid mix and became engulfed in the minerals growing in the fractured rock," Klein said. "This kept them completely isolated from the environment. The minerals proved to be the ultimate storage containers for these organisms, preserving their lipids and proteins for over 100 million years." "It's exciting that the research team was able to go back and examine samples that had been collected years ago for other reasons and find new discoveries," Shock said. "There will always be active new drilling, but this study raises the possibility of there being a lot more out there in the way of existing samples that could be analyzed." In the lab, samples from the rock interior had to be extracted since the outside of the drill core was stored under non-sterile conditions. So Klein and his colleagues took a number of careful steps to ensure the integrity of the sample interior wasn't compromised, and then analyzed the rocks with high-resolution microscopes, a confocal Raman spectrometer and a range of isotope techniques. While Raman spectroscopy enabled Klein to verify the presence of amino acids, proteins and lipids in the samples, it did not provide enough detailed information to correlate them with other hydrothermal systems. The lipids were of particular interest to Klein since they tend to be better preserved over long timescales, and have been studied in a wide range of seafloor environments. This prompted Klein to ask Schubotz, an expert in lipid biomarker analysis at the University of Bremen, if she could tease out further information about the lipids from these ancient rocks. Schubotz ran the lipids through an advanced liquid chromatography-based mass spectrometer system to separate out and identify their biochemical components. The analysis led to a remarkable discovery: the lipids from the Iberian margin match up with those from the Lost City hydrothermal field, which was discovered in 2000 in the Mid-Atlantic Ridge during an expedition on board the WHOI-operated research vessel Atlantis. This is significant because researchers believe the Lost City is a present-day analog to ancient hydrothermal systems on early Earth where life may have emerged. The active Lost City hydrothermal field, located at the Mid-Atlantic Ridge, is hosted by rocks very similar to those from the Iberia continental margin analyzed in this study. Lost City will be drilled during a forthcoming expedition by the International Ocean Discovery Program (IODP). Klein and his colleagues hope to gain more detailed insight in the subseafloor life by comparing rocks from the Iberia continental margin with those from other ODP and IODP drill cores. "I was stoked when I saw Dr. Schubotz's email detailing the analytical results," Klein said. "It was fascinating to find these particular biological substances - which had previously been found only at the Lost City hydrothermal field and in cold seeps - in rocks below the seafloor where life is extremely challenging. At that point we knew we were onto something really cool!" According to Klein, confirmation that life is possible in mantle rocks deep below the seafloor may have important implications for understanding subseafloor life across a wide range of geologic environments. "All the ingredients necessary to drive these ecosystems were made entirely from scratch," he said. "Similar systems have likely existed throughout most of Earth's history to the present day and possibly exist(ed) on other water-bearing rocky planetary bodies, such as Jupiter's moon Europa." The study reinforces the idea that life springs up anywhere there is water, even in seemingly hostile geological environments - a tantalizing prospect as scientists find more and more water elsewhere in the solar system. But Klein contends that, while scientists have long understood many of the forces driving microbial life above the seafloor, there is still a great deal of uncertainty when it comes to understanding biogeochemical processes occurring in the oceanic basement. "In the future, we'll be trying to learn more about these particular microorganisms and what the environmental conditions were in the mixing zone in that location. We also plan to go to different places where we think similar processes may have taken place, such as along the Newfoundland margin, and analyze samples to see if we find similar signatures. Broadening this research could provide additional insights about Earth's history and the search for life in the solar system." Artist's impression of NASA's New Horizons spacecraft encountering a Pluto-like object in the distant Kuiper Belt. But finding a suitable KBO flyby target was no easy task. 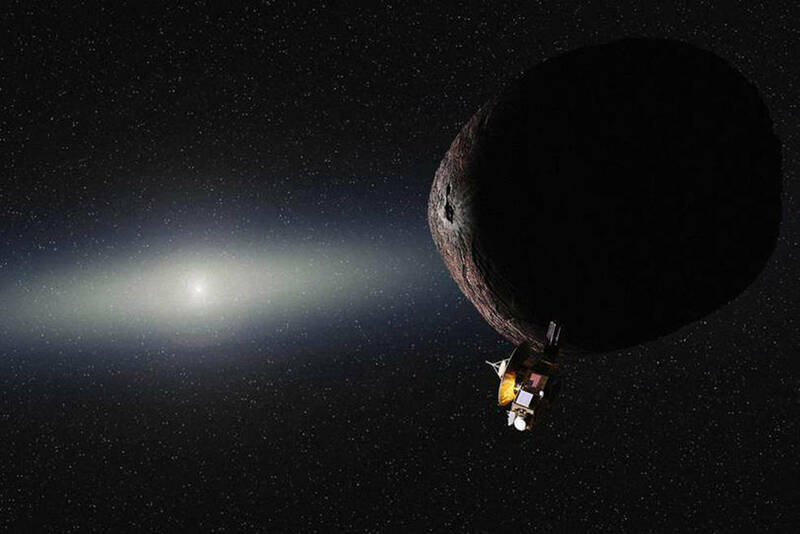 Starting a search in 2011 using some of the largest ground-based telescopes on Earth, the New Horizons team found several dozen KBOs, but none were reachable within the fuel supply available aboard the spacecraft. 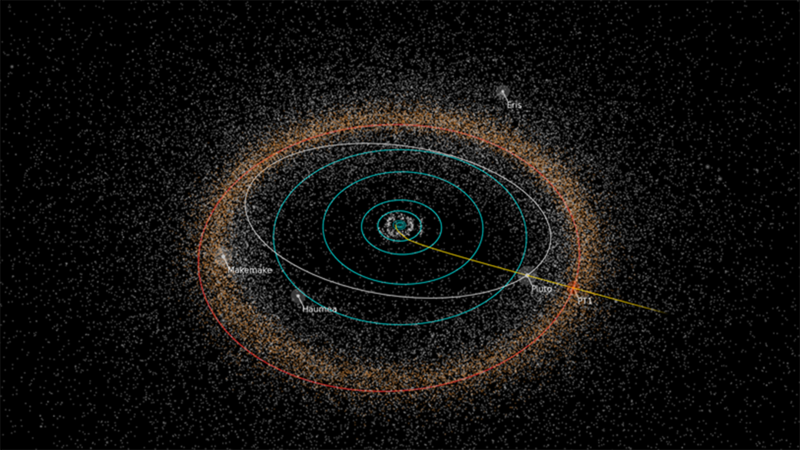 Path of NASA's New Horizons spacecraft toward its next potential target, the Kuiper Belt object 2014 MU69, nicknamed "PT1" (for "Potential Target 1") by the New Horizons team. NASA must approve any New Horizons extended mission to explore a KBO. The New Horizons spacecraft – currently 3 billion miles [4.9 billion kilometers] from Earth – is just starting to transmit the bulk of the images and other data, stored on its digital recorders, from its historic July encounter with the Pluto system. The spacecraft is healthy and operating normally. Generating and storing renewable energy, such as solar or wind power, is a key barrier to a clean-energy economy. When the Joint Center for Artificial Photosynthesis (JCAP) was established at Caltech and its partnering institutions in 2010, the U.S. Department of Energy (DOE) Energy Innovation Hub had one main goal: a cost-effective method of producing fuels using only sunlight, water, and carbon dioxide, mimicking the natural process of photosynthesis in plants and storing energy in the form of chemical fuels for use on demand. 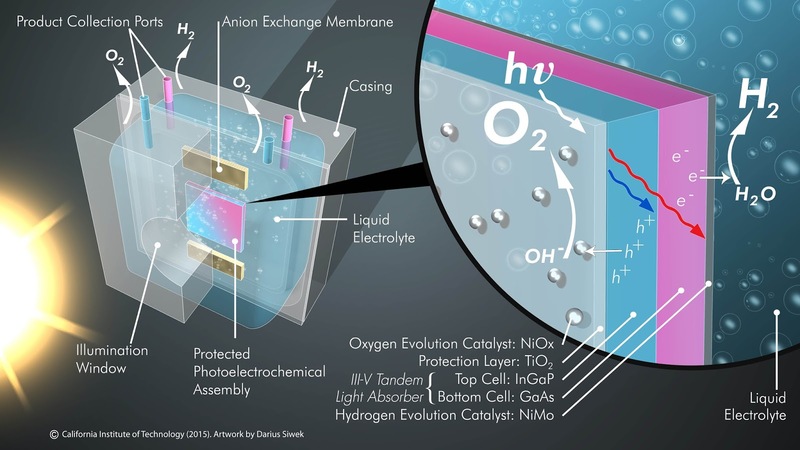 Illustration of an efficient, robust and integrated solar-driven prototype featuring protected photoelectrochemical assembly coupled with oxygen and hydrogen evolution reaction catalysts. Credit: Image provided courtesy of Joint Center for Artificial Photosynthesis; artwork by Darius Siwek. 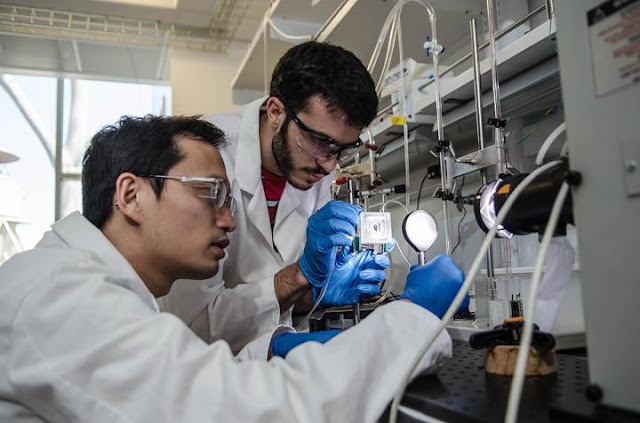 Over the past five years, researchers at JCAP have made major advances toward this goal, and they now report the development of the first complete, efficient, safe, integrated solar-driven system for splitting water to create hydrogen fuels. "This result was a stretch project milestone for the entire five years of JCAP as a whole, and not only have we achieved this goal, we also achieved it on time and on budget," says Caltech's Nate Lewis, George L. Argyros Professor and professor of chemistry, and the JCAP scientific director. "This accomplishment drew on the knowledge, insights and capabilities of JCAP, which illustrates what can be achieved in a Hub-scale effort by an integrated team," Atwater says. 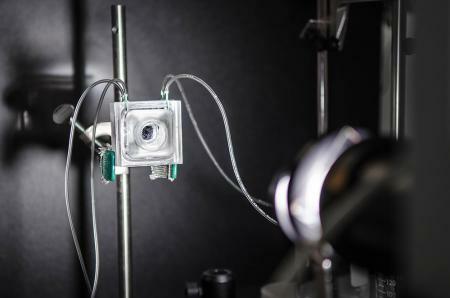 "The device reported here grew out of a multi-year, large-scale effort to define the design and materials components needed for an integrated solar fuels generator." A fully integrated photoelectrochemical device performing unassisted solar water splitting for the production of hydrogen fuel. Semiconductors such as silicon or gallium arsenide absorb light efficiently and are therefore used in solar panels. However, these materials also oxidize (or rust) on the surface when exposed to water, so cannot be used to directly generate fuel. A major advance that allowed the integrated system to be developed was previous work in Lewis's laboratory, which showed that adding a nanometers-thick layer of titanium dioxide (TiO2)—a material found in white paint and many toothpastes and sunscreens—onto the electrodes could prevent them from corroding while still allowing light and electrons to pass through. The new complete solar fuel generation system developed by Lewis and colleagues uses such a 62.5-nanometer-thick TiO2 layer to effectively prevent corrosion and improve the stability of a gallium arsenide–based photoelectrode. "This new system shatters all of the combined safety, performance, and stability records for artificial leaf technology by factors of 5 to 10 or more ," Lewis says. "Our work shows that it is indeed possible to produce fuels from sunlight safely and efficiently in an integrated system with inexpensive components," Lewis adds, "Of course, we still have work to do to extend the lifetime of the system and to develop methods for cost-effectively manufacturing full systems, both of which are in progress." Because the work assembled various components that were developed by multiple teams within JCAP, coauthor Chengxiang Xiang, who is co-leader of the JCAP prototyping and scale-up project, says that the successful end result was a collaborative effort. "JCAP's research and development in device design, simulation, and materials discovery and integration all funneled into the demonstration of this new device," Xiang says. These results are published in a paper titled "A monolithically integrated, intrinsically safe, 10% efficient, solar-driven water-splitting system based on active, stable earth-abundant electrocatalysts in conjunction with tandem III-V light absorbers protected by amorphous TiO2 films." In addition to Lewis, Atwater, and Xiang, other Caltech coauthors include graduate student Erik Verlage, postdoctoral scholars Shu Hu and Ke Sun, material processing and integration research engineer Rui Liu, and JCAP mechanical engineer Ryan Jones. Funding was provided by the Office of Science at the U.S. Department of Energy, and the Gordon and Betty Moore Foundation. These results were published in an article titled, "Quantum squeezing of motion in a mechanical resonator." In addition to Schwab, Clerk, and Marquardt, other coauthors include former graduate student Emma E. Wollman (PhD '15); graduate students Chan U. Lei and Ari J. Weinstein; former postdoctoral scholar Junho Suh; and Andreas Kronwald of Friedrich-Alexander-Universität in Erlangen, Germany. 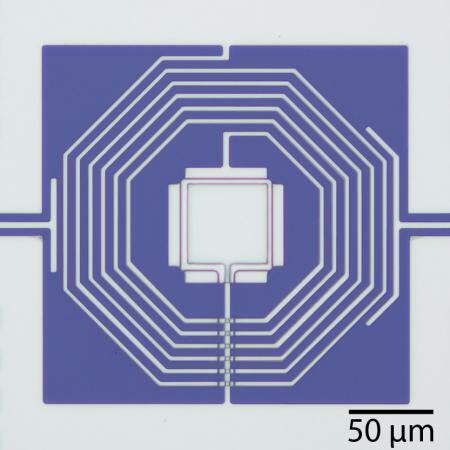 The work was funded by the National Science Foundation (NSF), the Defense Advanced Research Projects Agency, and the Institute for Quantum Information and Matter, an NSF Physics Frontiers Center that also has support from the Gordon and Betty Moore Foundation. One of the most pressing issues in modern biological conservation is "invasion biology". Due to unprecedented contacts between peoples and culture in today's "global village" certain animal and plant species are spreading widely throughout the world, often causing enormous damage to local species. This is the structure of Iron Age Floral List at each site. Circle size reflects the total number of new plant species recognized in Iron Age sites. 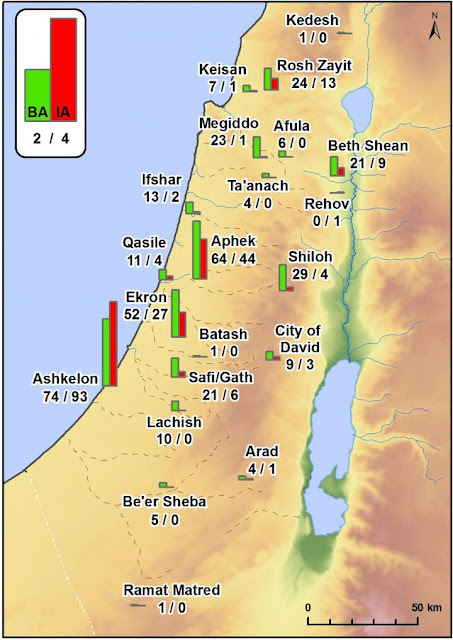 Red indicates new species that appeared only in Philistine Iron Age sites. Green indicates species that appeared only in non-Philistine Iron Age contexts. Blue denotes species shared by Philistine and non-Philistine sites. The three numbers represent the quantity of Philistine species/non-Philistine species/shared species, at a site. Credit: Map produced by M. Frumin using ArcGIS for Desktop (ArcMap 10.1), ESRI. The species they brought are all cultivars that had not been seen in Israel previously. This includes edible parts of the opium poppy (Papaver somniferum) which originates in western Europe; the sycamore tree (Ficus sycomorus), whose fruits are known to be cultivated in the eastern Mediterranean, especially Egypt, and whose presence in Israel as a locally grown tree is first attested to in the Iron Age by the presence of its fruit; and finally, cumin (Cuminum cyminum), a spice originating in the Eastern Mediterranean. Sue Frumin, a PhD student at Prof. Ehud Weiss's archaeobotanical lab, Bar-Ilan University, explains that "the edible parts of these species - opium poppy, sycamore, and cumin - were not identified in the archaeobotanical record of Israel prior to the Iron Age, when the Philistine culture first appeared in the region. None of these plants grows wild in Israel today, but instead grows only as cultivated plants." Species turnover between the Bronze and Iron Age at Iron Age sites. Each site is marked by two columns. The green column marks the number of Bronze Age species found in the Iron Age floral list. The red column marks the number of new species in Iron Age sites. Numbers beneath the site name give the absolute numbers of Bronze Age /Iron Age species. Map produced by M. Frumin using ArcGIS for Desktop (ArcMap 10.1), ESRI. In addition to the translocation of exotic plants from other regions, the Philistines were the first community to exploit over 70 species of synanthropic plants (species which benefit from living in the vicinity of man) that were locally available in Israel, such as Purslane, Wild Radish, Saltwort, Henbane and Vigna. These plant species were not found in archaeological sites pre-dating the Iron Age, or in Iron Age archaeological sites recognized as belonging to non-Philistine cultures - Canaanite, Israelite, Judahite, and Phoenician. The "agricultural revolution" that accompanied the Philistine culture reflects a different agrarian regime and dietary preferences to that of their contemporaries. The fact that the three exotic plants introduced by the Philistines originate from different regions accords well with the diverse geographic origin of these people. The Philistines - one of the so called Sea Peoples, and mentioned in the Bible and other ancient sources - were a multi-ethnic community with origins in the Aegean, Turkey, Cyprus and other regions in the Eastern Mediterranean who settled on the southern coastal plain of Israel in the early Iron Age (12th century BCE), and integrated with Canaanite and other local populations, finally to disappear at the end of the Iron Age (ca. 600 BCE). The Philistines also left their mark on the local fauna. In a previous study also published inScientific Reports in which two of the present authors (Maeir and Kolska Horwitz) participated, DNA extracted from ancient pig bones from Philistine and non-Philistine sites in Israel demonstrated that European pigs were introduced by the Philistines into Israel and slowly swamped the local pig populations through inter-breeding. As a consequence, modern wild boar in Israel today bears a European haplotype rather than a local, Near Eastern one. 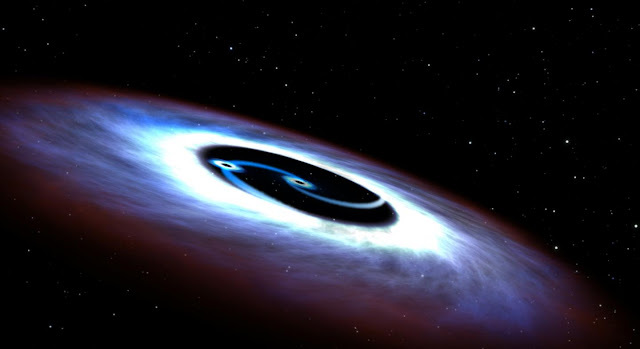 A University of Oklahoma astrophysicist and his Chinese collaborator have found two supermassive black holes in Markarian 231, the nearest quasar to Earth, using observations from NASA's Hubble Space Telescope. The discovery of two supermassive black holes--one larger one and a second, smaller one--are evidence of a binary black hole and suggests that supermassive black holes assemble their masses through violent mergers. OU astrophysicist and his Chinese collaborator used observations from NASA's Hubble Space Telescope to find two supermassive black holes in Markarian 231. "We are extremely excited about this finding because it not only shows the existence of a close binary black hole in Mrk 231, but also paves a new way to systematically search binary black holes via the nature of their ultraviolet light emission," said Lu, National Astronomical Observatories of China, Chinese Academy of Sciences. "The structure of our universe, such as those giant galaxies and clusters of galaxies, grows by merging smaller systems into larger ones, and binary black holes are natural consequences of these mergers of galaxies," said Dai. So over time, the two black holes discovered by Dai and Lu in Mrk 231 will collide and merge to form a quasar with a supermassive black hole. A quasar is an active galaxy with an illuminated center, which is short lived compared to the age of the universe. Cities are well known hot spots - literally. The urban heat island effect has long been observed to raise the temperature of big cities by 1 to 3°C (1.8 to 5.4°F), a rise that is due to the presence of asphalt, concrete, buildings, and other so-called impervious surfaces disrupting the natural cooling effect provided by vegetation. 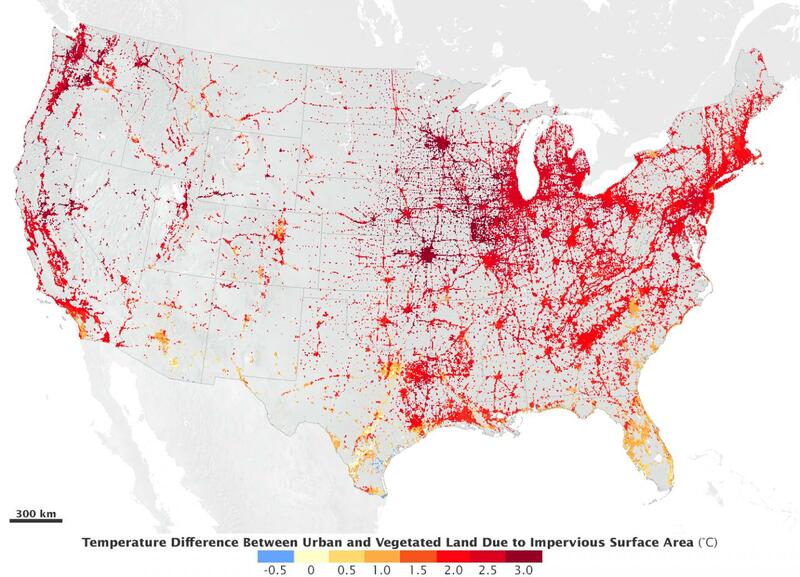 According to a new NASA study that makes the first assessment of urbanization impacts for the entire continental United States, the presence of vegetation is an essential factor in limiting urban heating. Impervious surfaces' biggest effect is causing a difference in surface temperature between an urban area and surrounding vegetation. The researchers, who used multiple satellites' observations of urban areas and their surroundings combined into a model, found that averaged over the continental United States, areas covered in part by impervious surfaces, be they downtowns, suburbs, or interstate roads, had a summer temperature 1.9°C higher than surrounding rural areas. In winter, the temperature difference was 1.5 °C higher in urban areas. "This has nothing to do with greenhouse gas emissions. It's in addition to the greenhouse gas effect. This is the land use component only," said Lahouari Bounoua, research scientist at NASA's Goddard Space Flight Center in Greenbelt, Maryland, and lead author of the study. The study, published this month in Environmental Research Letters, also quantifies how plants within existing urban areas, along roads, in parks and in wooded neighborhoods, for example, regulate the urban heat effect. "Everybody thinks, 'urban heat island, things heat up.' But it's not as simple as that. The amount and type of vegetation plays a big role in how much the urbanization changes the temperature," said research scientist and co-author Kurtis Thome of Goddard. The urban heat island effect occurs primarily during the day when urban impervious surfaces absorb more solar radiation than the surrounding vegetated areas, resulting in a few degrees temperature difference. The urban area has also lost the trees and vegetation that naturally cool the air. As a by-product of photosynthesis, leaves release water back into to the atmosphere in a process called evapotranspiration, which cools the local surface temperature the same way that sweat evaporating off a person's skin cools them off. Trees with broad leaves, like those found in many deciduous forests on the East coast, have more pores to exchange water than trees with needles, and so have more of a cooling effect. 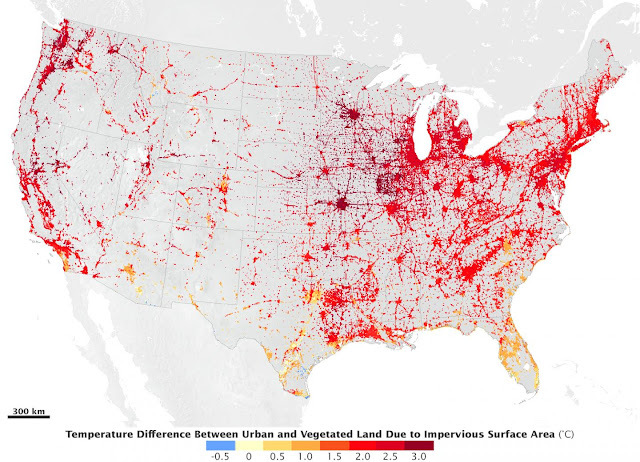 Impervious surface and vegetation data from NASA/U.S. Geologic Survey's Landsat 7 Enhanced Thematic Mapper Plus (EMT+) sensor and NASA's Moderate Resolution Imaging Spectroradiometer (MODIS) sensors on the Terra and Aqua satellites were combined with NASA's Simple Biosphere model to recreate the interaction between vegetation, urbanization and the atmosphere at five-kilometer resolution and at half-hour time steps across the continental United States for the year 2001. The temperatures associated with urban heat islands range within a couple degrees, even within a city, with temperatures peaking in the central, often tree-free downtown and tapering out over tree-rich neighborhoods often found in the suburbs. The northeast I-95 corridor, Baltimore-Washington, Atlanta and the I-85 corridor in the southeast, and the major cities and roads of the Midwest and West Coast show the highest urban temperatures relative to their surrounding rural areas. Smaller cities have less pronounced increases in temperature compared to the surrounding areas. In cities like Phoenix built in the desert, the urban area actually has a cooling effect because of irrigated lawns and trees that wouldn't be there without the city. "Anywhere in the U.S. small cities generate less heat than mega-cities," said Bounoua. The reason is the effect vegetation has on keeping a lid on rising temperatures. Bounoua and his colleagues used the model environment to simulate what the temperature would be for a city if all the impervious surfaces were replaced with vegetation. Then slowly they began reintroducing the urban impervious surfaces one percentage point at a time, to see how the temperature rose as vegetation decreased and impervious surfaces expanded. What they found was unexpected. When the impervious surfaces were at one percent the corresponding rise in temperature was about 1.3°C. That temperature difference then held steady at about 1.3°C as impervious surfaces increased to 35 percent. As soon as the urban impervious surfaces surpassed 35 percent of the city's land area, then temperature began increasing as the area of urban surfaces increased, reaching 1.6°C warmer by 65 percent urbanization. At the human level, a rise of 1°C can raise energy demands for air conditioning in the summer from 5 to 20 percent in the United States, according the Environmental Protection Agency. So even though 0.3°C may seem like a small difference, it still may have impact on energy use, said Bounoua, especially when urban heat island effects are exacerbated by global temperature rises due to climate change. Understanding the tradeoffs between urban surfaces and vegetation may help city planners in the future mitigate some of the heating effects, said Thome. "Urbanization is a good thing," said Bounoua. "It brings a lot of people together in a small area. Share the road, share the work, share the building. But we could probably do it a little bit better." Computer models of developing cancers reveal how tiny movements of cells can quickly transform the makeup of an entire tumour. The models reinforce laboratory studies of how tumours evolve and spread, and why patients can respond well to therapy, only to relapse later. 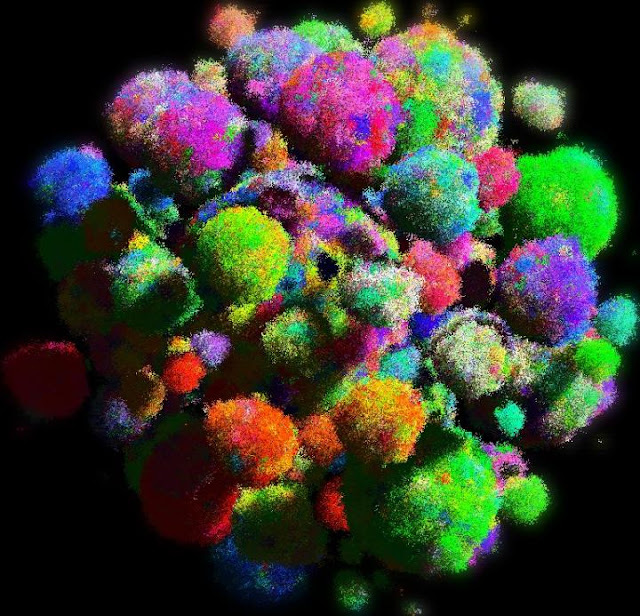 This is a three-dimensional model of a tumor showing cell types in varying colors. Researchers used mathematical algorithms to create three-dimensional simulations of cancers developing over time. They studied how tumours begin with one rogue cell which multiplies to become a malignant mass containing many billions of cells. Their models took into account changes that occur in cancerous cells as they move within the landscape of a tumour, and as they replicate or die. They also considered genetic variation, which makes some cells more suited to the environment of a tumour than others. They found that movement and turnover of cells in a tumour allows those that are well suited to the environment to flourish. Any one of these can take over an existing tumour, replacing the original mass with new cells quickly - often within several months. This helps explain why tumours are comprised mostly of one type of cell, whereas healthy tissue tends to be made up of a mixture of cell types. However, this mechanism does not entirely mix the cells inside the tumour, the team say. This can lead to parts of the tumour becoming immune to certain drugs, which enables them to resist chemotherapy treatment. Those cells that are not killed off by treatment can quickly flourish and repopulate the tumour as it regrows. Researchers say treatments that target small movements of cancerous cells could help to slow progress of the disease. The study, a collaboration between the University of Edinburgh, Harvard University and Johns Hopkins University, is published in the journal Nature. The research was supported by the Leverhulme Trust and The Royal Society of Edinburgh. Dr Bartlomiej Waclaw, of the University of Edinburgh's School of Physics and Astronomy, who is the lead author of the study, said: "Computer modelling of cancer enables us to gain valuable insight into how this complex disease develops over time and in three dimensions." Their results were published today in Cell Reports. "Retinal neurons associated with vision generate connections in the brain, and as the brain develops it strengthens and maintains some of those connections more than others. The disused connections are eliminated," said Michael Fox, an associate professor at the Virginia Tech Carilion Research Institute who led the study. "We found that this activity-dependent pruning might not be as simple as we'd like to believe." Fox and his team of researchers used two different techniques to examine how retinal ganglion cells - neurons that live in the retina and transmit visual information to the visual centers in the brain - develop in a mouse model. "It's widely accepted that synaptic connections from about 20 retinal ganglion cells converge onto cells in the lateral geniculate nucleus during development, but that number reduces to just one or two by the third week of a mouse's life," Fox said. "It was thought that the mature retinal ganglion cells develop several synaptic terminals that cluster around information exchange points." Using a technique dubbed "brainbow," the Virginia Tech Carilion Research Institute scientists tagged synaptic terminals with proteins that fluoresce different colors. The researchers thought one color, representing the single source of the many terminals, would dominate in the clusters. Instead, several different colors appeared together, intertwined but distinct. "The samples showed a true 'brainbow,'" said Aboozar Monavarfeshani, a graduate student in Fox's laboratory who tagged the terminals. "I could see, right in front of me, something very different than the concept I learned from my textbooks." The results showed individual terminals from more than one retinal ganglion cell in a mature mouse brain. The study is a direct contradiction to some other research indicating neural development weeds out most connections between retinal ganglion axons and target cells in the brain, and Fox and his team have more questions. "Is this a discrepancy a technical issue with the different types of approaches applied in all of these disparate studies?" Fox asked. "Possibly, but perhaps it's more likely that retinal ganglion cells are more complex than previously thought." 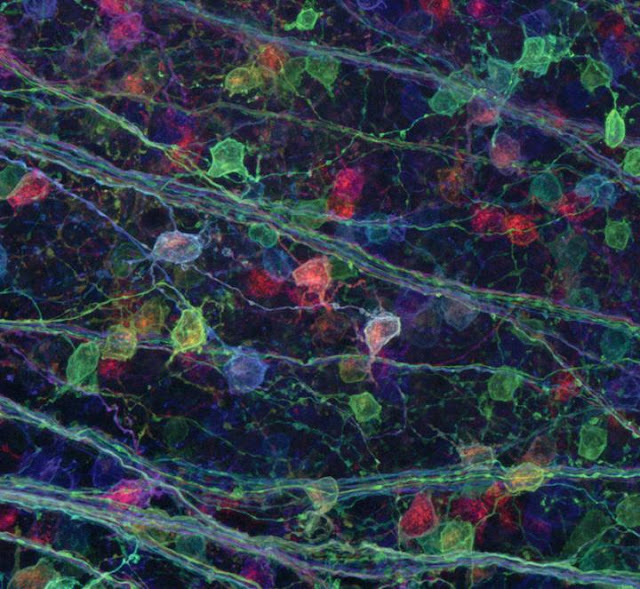 Along with the brainbow technique, Fox's team also imaged these synaptic connections with electron microscopy. Sarah Hammer, currently a sophomore at Virginia Tech, traced individual retinal terminals through hundreds of serial images. The data confirmed the results from "brainbow" analysis - retinal axons from numerous retinal ganglion cells remained present on adult brain cells. "These results are not what we expected, and they will force us to reevaluate our understanding of the architecture and flow of visual information through neural pathways," Fox said. "The dichotomy of these results also sheds important light on the benefits of combining approaches to understand complicated problems in science." Albert Pan, an assistant professor in the Medical College of Georgia at Georgia Regents University, who is an expert in neural circuitry development, said the results are unexpected. "The research provides strong evidence for multiple innervation and calls for a reevaluation of the current understanding of information flow and neural circuit maturation in the visual system" said Pan, who was not involved in the study. "The paper probably generates more questions than it answers, which is a hallmark of an exciting research study." The research continues, as Fox's team works to understand exactly how many retinal terminals converge and how they might convey information differently. Once the scientists understand the intricacies of the brain's visual circuitry, they might be able to start developing therapeutics for when it goes wrong. "The lesson in this particular study is that no single technique gives us all the right answers," Fox said. "Science is never as simple as we like to make it seem." This animation shows water elevation for an earthquake-induced tsunami at the Southwest of Crete. Though not as frequent as in the Pacific and Indian oceans, tsunamis also occur in the Mediterranean, mainly due to earthquakes generated when the African plate slides underneath the Eurasian plate. About 10% of all tsunamis worldwide happen in the Mediterranean, with on average, one large tsunami happening in the region once a century. The risk to coastal areas is high because of the high population density in the area - some 130 million people live along the sea's coastline. Moreover, tsunami waves in the Mediterranean need to travel only a very short distance before hitting the coast, reaching it with little advance warning. The new study shows the extent of flooding in selected areas along the coasts of southern Italy and Greece, if hit by large tsunamis in the region, and could help local authorities identify vulnerable areas. "The main gap in relevant knowledge in tsunami modelling is what happens when tsunami waves approach the nearshore and run inland," says Achilleas Samaras, the lead author of the study and a researcher at the University of Bologna in Italy. The nearshore is the zone where waves transform - becoming steeper and changing their propagation direction - as they propagate over shallow water close to the shore. "We wanted to find out how coastal areas would be affected by tsunamis in a region that is not only the most active in the Mediterranean in terms of seismicity and tectonic movements, but has also experienced numerous tsunami events in the past." The team developed a computer model to represent how tsunamis in the Mediterranean could form, propagate and hit the coast, using information about the seafloor depth, shoreline and topography. "We simulate tsunami generation by introducing earthquake-generated displacements at either the sea bed or the surface," explains Samaras. "The model then simulates how these disturbances - the tsunami waves - propagate and are transformed as they reach the nearshore and inundate coastal areas." This animation shows water elevation for an earthquake-induced tsunami at the East of Sicily. "Although the simulated earthquake-induced tsunamis are not small, there has been a recorded history of significantly larger events, in terms of earthquake magnitude and mainshock areas, taking place in the region," says Samaras. For example, a clustering of earthquakes, the largest with magnitude between 8.0 and 8.5, hit off the coast of Crete in 365 AD. The resulting tsunami destroyed ancient cities in Greece, Italy and Egypt, killing some 5000 people in Alexandria alone. More recently, an earthquake of magnitude of about 7.0 hit the Messina region in Italy in 1908, causing a tsunami that killed thousands, with observed waves locally exceeding 10 metres in height. The team sees the results as a starting point for a more detailed assessment of coastal flooding risk and mitigation along the coasts of the Eastern Mediterranean. "Our simulations could be used to help public authorities and policy makers create a comprehensive database of tsunami scenarios in the Mediterranean, identify vulnerable coastal regions for each scenario, and properly plan their defence." Citation: Samaras, A. G., Karambas, Th. V., and Archetti, R.: Simulation of tsunami generation, propagation and coastal inundation in the Eastern Mediterranean, Ocean Sci., 11, 643-655, doi:10.5194/os-11-643-2015, 2015. 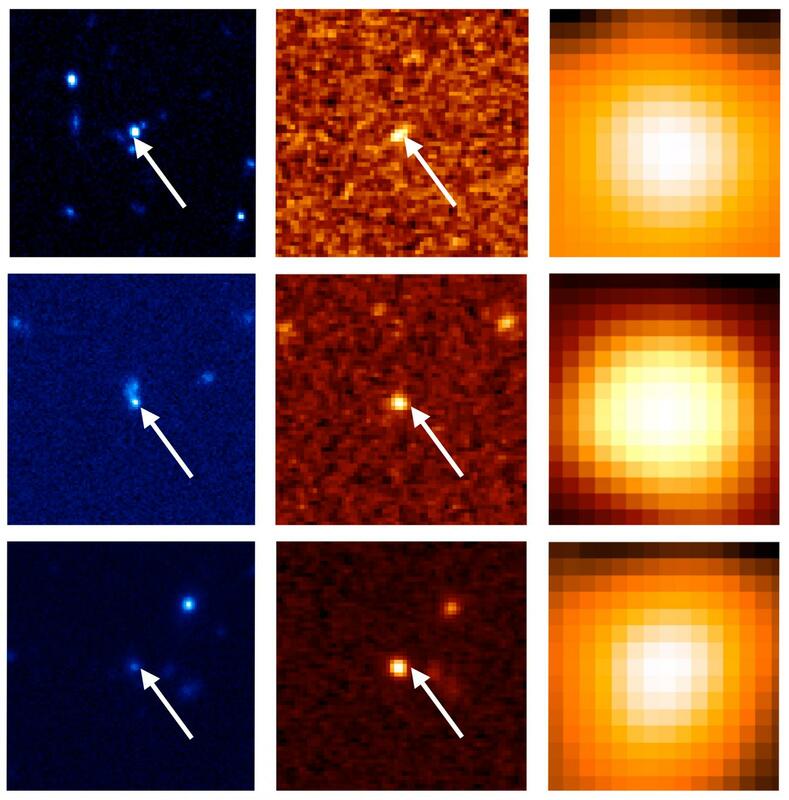 A group of researchers from Ehime University, Princeton University, and the National Astronomical Observatory of Japan (NAOJ) among others has performed an extensive search for Dust Obscured Galaxies (DOGs) using data obtained from the Subaru Strategic Program with Hyper Suprime-Cam (HSC). HSC is a new wide-field camera mounted at the prime focus of the Subaru Telescope and is an ideal instrument for searching for this rare and important class of galaxy. The research group discovered 48 DOGs, and has measured how common they are. Since DOGs are thought to harbor a rapidly growing black hole in their centers, these results give us clues for understanding the evolution of galaxies and supermassive black holes. The left, middle, and right panels show optical image from HSC, near-infrared image from VIKING, and mid-infrared image from WISE, respectively. The image size is 20 square arcsecond (1 arcsecond is 1/3600 degree). It is clear that DOGs are faint in the optical, but are extremely bright in the infrared. How did galaxies form and evolve during the 13.8-billion-year history of the universe? This question has been the subject of intense observational and theoretical investigation. Recent studies have revealed that almost all massive galaxies harbor a supermassive black hole whose mass reaches up to a hundred thousand or even a billion times the mass of the sun, and their masses are tightly correlated with those of their host galaxies. This correlation suggests that supermassive black holes and their host galaxies have evolved together, closely interacting as they grow. The group of researchers, lead by Dr. Yoshiki Toba (Ehime University), focused on the Dust Obscured Galaxies (DOGs) as a key population to tackle the mystery of the co-evolution of galaxies and black holes. DOGs are very faint in visible light, because of the large quantity of obscuring dust, but are bright in the infrared. The brightest infrared DOGs in particular are expected to harbor the most actively growing black hole. In addition, most DOGs are seen in the epoch when the star formation activity of galaxies reached its peak, 8-10 billion years ago. Thus both DOGs and their black holes are rapidly growing, at an early phase of their co-evolution. However, since DOGs are rare and are hidden behind significant amount of dust, previous visible light surveys have found very few such objects. Hyper Suprime-Cam (HSC) is a new instrument installed on the 8.2 meter Subaru Telescope in 2012. It is a wide-field camera with a field of view nine times the size of the full moon. An ambitious legacy survey with HSC started in March 2014 as a "Subaru strategic program (Note 1)"; total of 300 nights have been allocated for a five year period. The Subaru strategic program with HSC started to deliver large quantities of excellent imaging data. The research team selected DOGs from early data from the HSC Subaru Strategic Program (SSP). 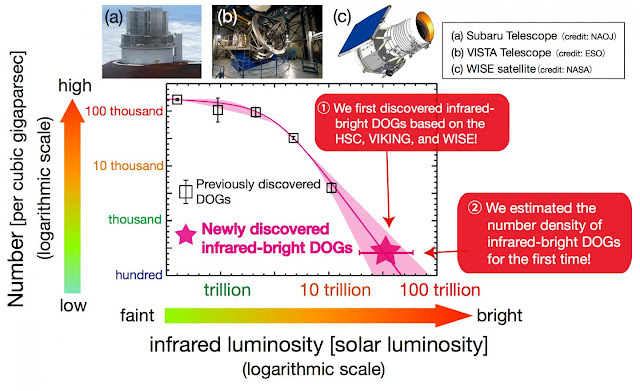 DOGs are thousand times brighter in the infrared than the optical and the team selected their targets using the HSC and NASA's Wide-field Infrared Survey Explorer (WISE: Note 2). They also utilized the data from the VISTA Kilo-degree Infrared Galaxy survey (VIKING: Note 3). The all-sky survey data with WISE are crucial to discover spatially rare DOG while the VIKING data are useful to identify the DOGs more precisely. The number density of DOGs that were newly selected in this study, as a function of infrared luminosity. Data represented by the red star is the HSC result. The research team found that (i) their infrared luminosity exceeds 10 trillion suns, and (ii) their number density is about 300 per cubic gigaparsecs. Consequently, 48 DOGs were discovered. Each of these is 10 trillion times more luminous in the infrared than the sun. The number density of these luminous DOGs is about 300 per cubic gigaparsecs. It is theoretically predicted that these DOGs harbor an actively evolving supermassive black hole. This result provides researchers new insights into the mysteries of the co-evolution of galaxies and supermassive black holes from the unique observational prospects. In this research, the research team discovered 48 Dust Obscured Galaxies and revealed their statistical properties of infrared luminous DOGs in particular, for the first time. The first author of the paper Dr. Yoshiki Toba said, "There are no instruments on large telescopes with the sensitivity and field of view of HSC, and hence HSC is unique in its ability to search for DOGs. The HSC survey will cover more than 100 times as much area of the sky as the area used for this study when it is complete, allowing the identification of thousands of DOGs in the near future. We are planning to investigate the detailed properties of DOGs and their central black holes using observations from many telescope." Also, Professor Tohru Nagao, second author of the paper, said "The Subaru Strategic Program with HSC has just begun. In the near future, exciting results will be released not only from studies on galaxy evolution, but also from in fields such as solar systems, stars, nearby galaxies, and cosmology." Visualization of dark matter as energy confined within non-radiating anapoles. Dr. Miroshnichenko with his visualization of anapoles as dark matter. A team of international scientists, led by astronomers from the Cardiff University School of Physics and Astronomy, has shown for the first time that galaxies can change their structure over the course of their lifetime. By observing the sky as it is today, and peering back in time using the Hubble and Herschel telescopes, the team have shown that a large proportion of galaxies have undergone a major ‘metamorphosis’ since they were initially formed after the Big Bang. By providing the first direct evidence of the extent of this transformation, the team hope to shed light on the processes that caused these dramatic changes, and therefore gain a greater understanding of the appearance and properties of the Universe as we know it today. In their study, which has been published in the Monthly Notices of the Royal Astronomical Society¸ the researchers observed around 10,000 galaxies currently present in the Universe using a survey of the sky created by the Herschel ATLAS and GAMA projects. The researchers then classified the galaxies into the two main types: flat, rotating, disc-shaped galaxies (much like our own galaxy, the Milky Way); and large, spherical galaxies with a swarm of disordered stars. Using the Hubble and Herschel telescopes, the researchers then looked further out into the Universe, and thus further back in time, to observe the galaxies that formed shortly after the Big Bang. The researchers showed that 83 per cent of all the stars formed since the Big Bang were initially located in a disc-shaped galaxy. However, only 49 per cent of stars that exist in the Universe today are located in these disc-shaped galaxies—the remainder are located in spherical-shaped galaxies. The results suggest a massive transformation in which disc-shaped galaxies became spherical-shaped galaxies. A popular theory is that the this transformation was caused by many cosmic catastrophes, in which two disk-dominated galaxies, straying too close to each other, were forced by gravity to merge into a single galaxy, with the merger destroying the disks and producing a huge pileup of stars. An opposing theory is that the transformation was a more gentle process, with stars formed in a disk gradually moving to the centre of a disk and producing a central pile-up of stars. Lead author of the study Professor Steve Eales, from Cardiff University’s School of Physics and Astronomy, said: “Many people have claimed before that this metamorphosis has occurred, but by combining Herschel and Hubble, we have for the first time been able to accurately measure the extent of this transformation. Did Alien Life Arise Spontaneously? Seeds of Life Spread from One Living Planet in All Directions: New Theory Says "Custers of Life Form, Grow and Overlap"
In this theoretical artist's conception of the Milky Way galaxy, translucent green "bubbles" mark areas where life has spread beyond its home system to create cosmic oases, a process called panspermia. New research suggests that we could detect the pattern of panspermia, if it occurs. Astronomers have found evidence for a faded electron cloud “coming back to life,” much like the mythical phoenix, after two galaxy clusters collided. This “radio phoenix,” so-called because the high-energy electrons radiate primarily at radio frequencies, is found in Abell 1033. The system is located about 1.6 billion light years from Earth. Black holes don't actually swallow and destroy physical information, according to an idea proposed today by Stephen Hawking at the Hawking Radiation conference being held at KTH Royal Institute of Technology. Instead, they store it in a two-dimensional hologram. One of the most baffling questions facing a generation of physicists is what happens to the information about the physical state of things that are swallowed up by black holes? Is it destroyed, as our understanding of general relativity would predict? If so, that would violate the laws of quantum mechanics. This artist's concept illustrates a supermassive black hole with millions to billions times the mass of our sun. Supermassive black holes are enormously dense objects buried at the hearts of galaxies. 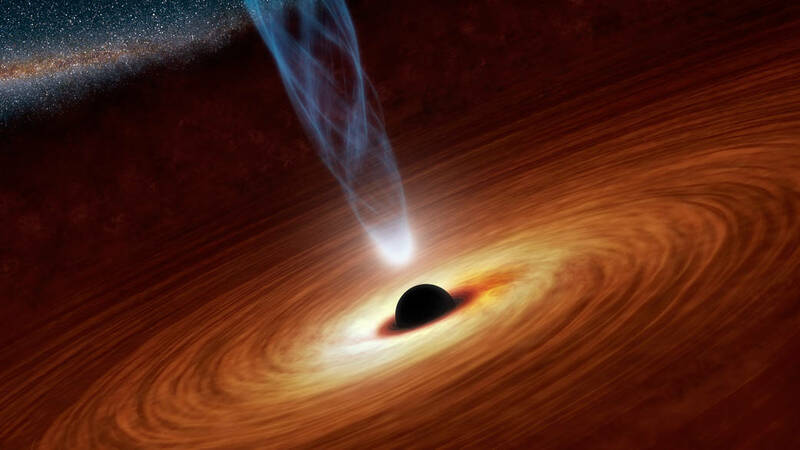 Today at the Hawking Radiation conference, Hawking presented his latest idea about how this paradox can be solved — that is, how information is preserved even if it's sucked into a black hole. 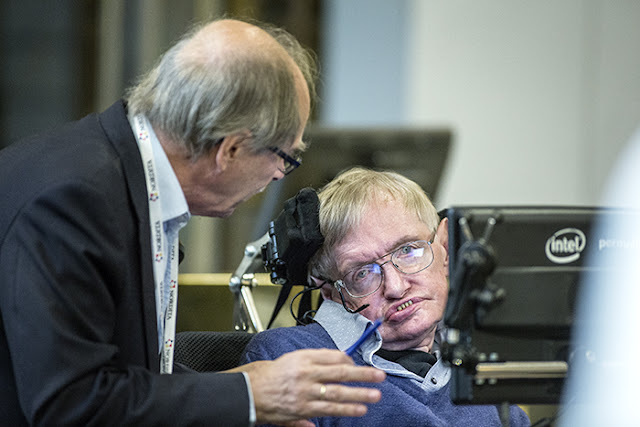 Nobel physics laureate Gerard 't Hooft, of Utrecht University, the Netherlands, confers with Stephen Hawking after the Cambridge professor presented his solution to the information loss paradox. Hawking is in town for a weeklong conference on the information loss paradox, which is co-hosted by Nordita at KTH Royal Institute of Technology. Hawking is in town for the weeklong conference, which is co-sponsored by Nordita, UNC and the Julian Schwinger Foundation. Nordita is co-hosted by KTH and Stockholm University. UNC Physicist Laura Mersini-Houghton was instrumental in assembling 32 of the world's leading physicists to tackle the problem, which stems from contradications between quantum mechanics and general relativity. Everything in our world is encoded with quantum mechanical information; and according to the laws of quantum mechanics, this information should never entirely disappear, no matter what happens to it. Not even if it gets sucked into a black hole. But Hawking's new idea is that the information doesn't make it inside the black hole at all. Instead, it's permanently encoded in a 2D hologram at the surface of the black hole's event horizon, or the field surrounding each black hole which represents its point of no return. As we understand them, black holes are regions of space-time where stars, having exhausted their fuel, collapse under their own gravity, creating a bottomless pit that swallows anything approaching too closely. Not even light can escape them, since their gravitational pull is so infinitely powerful. "The information is not stored in the interior of the black hole as one might expect, but in its boundary — the event horizon," he said. Working with Cambridge Professor Malcolm Perry (who spoke afterward) and Harvard Professor Andrew Stromberg, Hawking formulated the idea that information is stored in the form of what are known as super translations. 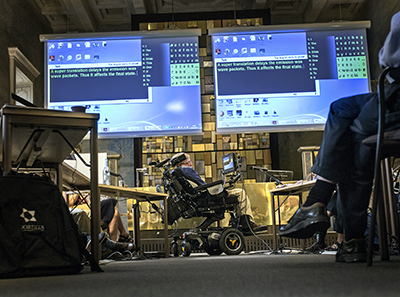 Conference participants wait while Stephen Hawking composes an answer to a question. "The idea is the super translations are a hologram of the ingoing particles," Hawking said. "Thus they contain all the information that would otherwise be lost." This information is emitted in the quantum fluctuations that black holes produce, albeit in "chaotic, useless form," Hawking said. "For all practical purposes the information is lost." But in his lecture in Stockholm the previous night, Hawking also offered compelling thoughts about where things that fall into a black hole could eventually wind up. "The existence of alternative histories with black holes suggests this might be possible," Hawking said. "The hole would need to be large and if it was rotating it might have a passage to another universe. But you couldn't come back to our universe. "So although I'm keen on space flight, I'm not going to try that." Hubble Sees a "Mess of Stars"